The Pontardawe Poor Law Union was created on 26th March 1875 and comprised seven parishes that had previously formed part of the Neath and Swansea Poor Law Unions, namely Cilybebyll, Llanguicke, Mawr, Rhyndwclydach, Ynysymond, Ystradgynlais Higher, and Ystradgynlais Lower. 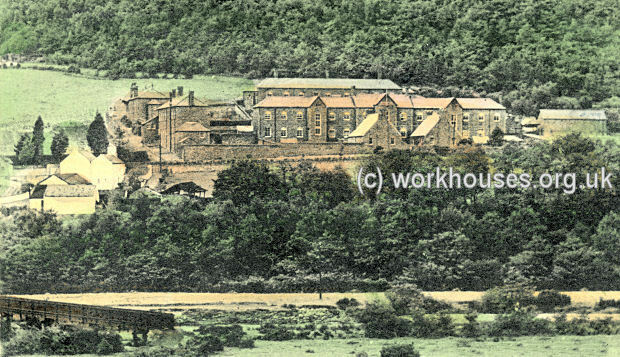 In 1879, a new Pontardawe union workhouse was erected with accommodation for 107 inmates. It was situated at the north-east of Pontardawe, on a sloping site at the north side of Brecon Road. Its location and layout are shown on the 1898 map below. The buildings comprised two small blocks flanking the entrance, perhaps one containing the Guardians board-room, and the other a porter's quarters. The main building had a typical T-shaped layout, with the master's rooms at the centre with kitchens and dining-hall to the rear. Males were accommodated at one side and females at the other. A separate block to the rear may have housed the infirmary. Pontardawe from the south-east, c.1907. From 1904, to protect them from disadvantage in later life, the birth certificates for those born in the workhouse gave its address just as 84 Brecon Road, Pontardawe. In 1930, the workhouse was redesignated as the Pontardawe Public Assistance Institution when the functions of the Poor Law Union were taken over by the Glamorgan County Council. In 1948, the premises became the Danybryn Hostel which finally closed in 1988. The building was demolished shortly afterwards and the Dan Y Bryn residential care home now occupies the site. West Glamorgan Archive Service, County Hall, Oystermouth Road, Swansea SA1 3SN. Holdings include: Board of Guardians' minutes (1875-1930); Admissions and discharges (1915-19, 1925-43); Register of inmates (1917-41); Birth and death registers (1914-43); Creed register (1902-21); etc. Ancestry UK currently has Pontardawe Workhouse creed register (1902-21).